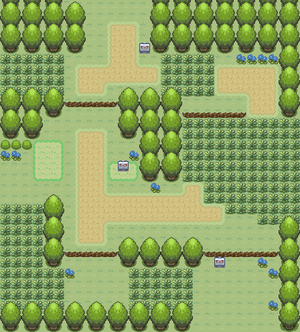 Enter Route 202 and into the first grass you see. Professor Rowan’s assistant (Lucas if you’re playing a girl, Dawn if you’re playing a boy), will call you over and show you how to catch Pokémon. It’s helpful to lower the foe’s HP into the yellow or red before throwing the ball. The assistant will then bestow upon you 5 Pokéballs. All are recommended for capture at this point in time for a large amount of type coverage. Training them early in the game is also essential, so start immediately. Go east past the grass bush and north through another bush. A trainer stands in front of some trees at the far end. Head south from Tristan and stop when you’re facing a column of trees. Take two steps down and travel east you’ll unavoidably come into a trainer’s view. Head east and north through tall grass. At the end is a trainer. Head west past the main track and into the grassy bush. You’ll find a Potion. Leave the bush and walk back onto the main path. Head northwards to Jubilife City. Kricketot is a new Bug type Pokémon, found mostly at night and in the morning. They are useful for their type coverage early on in the game, but will not be as useful later. Pick one up to complete your Pokédex. Shinx is an interesting little guy, being a Electric type, and showing up so early in the game. Shinx will be useful throughout the game, able to take out Flying and Water typed with ease, and can become very formidable fighters. Pick one up for type coverage. This page was last edited on 1 August 2016, at 18:14. This page has been accessed 44,417 times.